More painty background cards. These were made with the paint left on the palette from the cards I shared yesterday and another project I am working on. They were made in a couple of stages and finally got finished last night. The backgrounds were lots of different paints all from the pink and purple colour family with a little bit of blue thrown in… especially with the extra paint from the other project. I love all the layers this created. I’d also added some stamping although kept that quite simple with some stars and the Gummiapan text stamp. Then I had to decide what to do with them. The first I decided to use a new Visible Image stamp of the camera and stamped and cut that out. I used my stamp platform to ensure it stamped perfectly as it’s quite a large and detailed image. 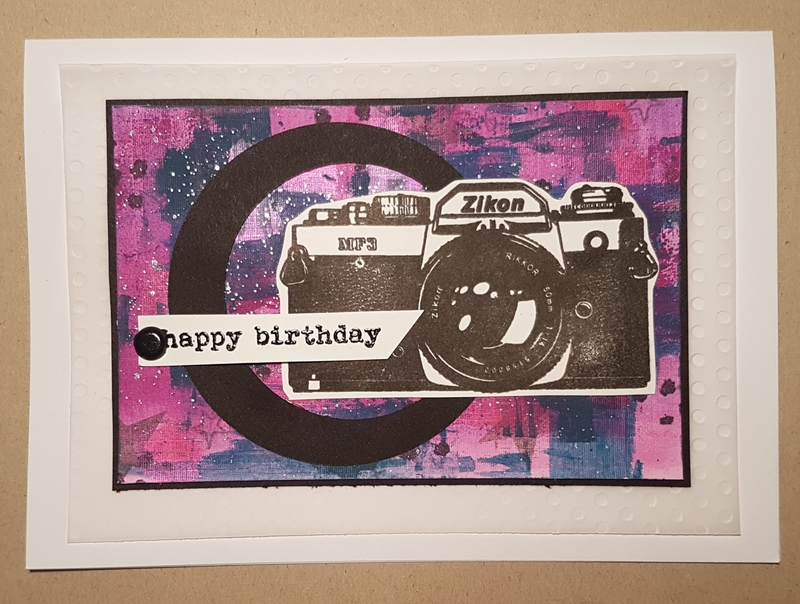 I decided it needed some relief to the background so added the diecut wonky circle from black cardstock and then the sentiment that I embossed and affixed using a brad. I mounted it onto black and then decided to emboss some vellum to create a textured background. The second card I decided to add a strip of the vellum that I had cut off the first card and again used a brad to affix it. 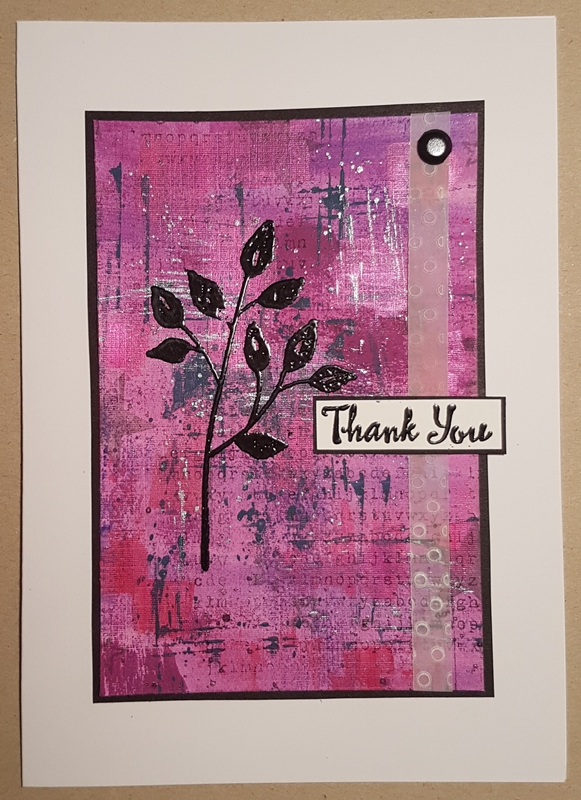 I decided to heat emboss the main image onto the background directly and used the beautiful leaf sprig from my new Stampin Up Palette of Petals set I got on pre order from the new spring summer catalogue. I also chose a sentiment from that set and heat embossed that onto a label and mounted that on black card along with the whole panel. With all the art alchemy paints added to the backgrounds and the feature images I think these are fun modern and edgy cards but still full of sparkle and shine. Happy with these … And my new stash. I’m going to have lots of fun with the new stash I have recently purchased.